Joselin Castro, 18, from Colorado, born in Mexico. Knowing our roots is very important to my family. That is why, no matter where we go or how far we travel, we will never let go of some of the traditions we have carried along for many years now. My parents always talk to my sisters and I about where we came from. Although my sisters weren’t born in Mexico like me, our parents passed down and instilled in us their experiences and life lessons about what it is like to grow up in a small town with little resources.My parents did not make it past high school, which makes me a first-generation college student. Being the oldest of three sisters, I put a lot of pressure on myself to accomplish my goals. I know my two younger sisters are watching, and I hope I can set a good example for them, so they can someday follow in my footsteps.Growing up in America has been very different than growing up in Mexico. I have enjoyed both experiences. Navigating school and social life can be challenging for any kid. But it’s extra so if there is a language barrier. When I came to America at age 7, I felt overwhelmed in school and didn’t speak the language. I would cry whenever my mom would drop me off. Of course, it got better. Here in America I have had the privilege of being able to grow up with technology in school and just having more opportunities to thrive.To me, my small town in Mexico will always be home. It’s where I am from and it’s where my family’s values and traditions were formed. Although I don’t consider the U.S to be my home, it is very important for me to stay here. America is where I have spent most of my life and it’s where my sisters were born. 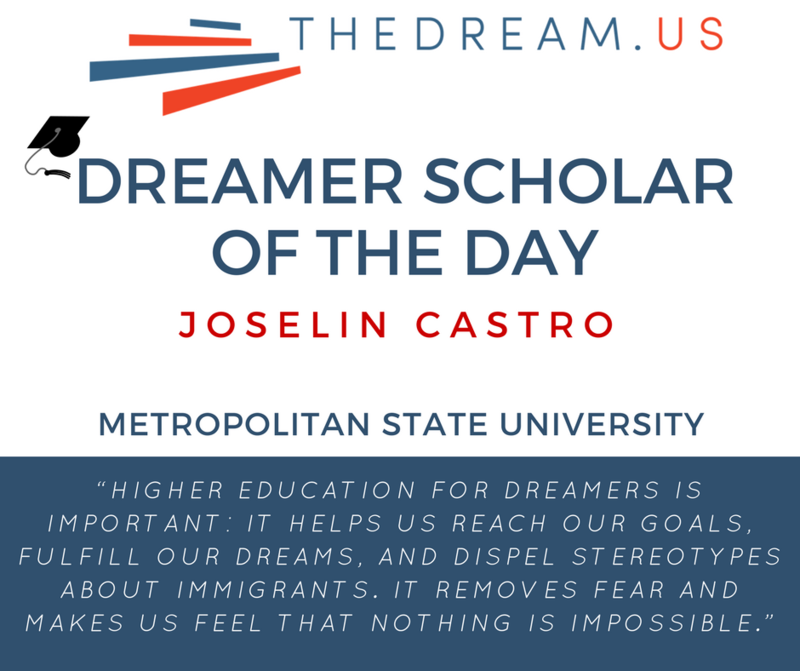 It’s also the place where I have more opportunity of reaching my goals and the place where my sisters can reach their goals and fulfill their potential.Higher education for DREAMers is important: it helps us reach our goals, fulfill our dreams, and dispel stereotypes about immigrants. It removes fear and makes us feel that nothing is impossible.I want to graduate from Metropolitan State University and become a nurse. As an immigrant, I have learned that it is very hard to be able to receive access to needed and affordable medical care. I would like to help those people who have suffered and made many sacrifice– people just like my family.